Enjoy a private 2-hour art mural tour with your very own local guide. You'll see 8-10 lively public art pieces while exploring art, culture and Chicago history in the heart of the city! As you walk, your local guide will describe the themes and messages that inspired the public art pieces throughout this vibrant community. When you arrive at the designated meeting spot, you will be greeted by your friendly local tour guide, who will be wearing a t-shirt or holding a sign with our name and logo for easy recognition. 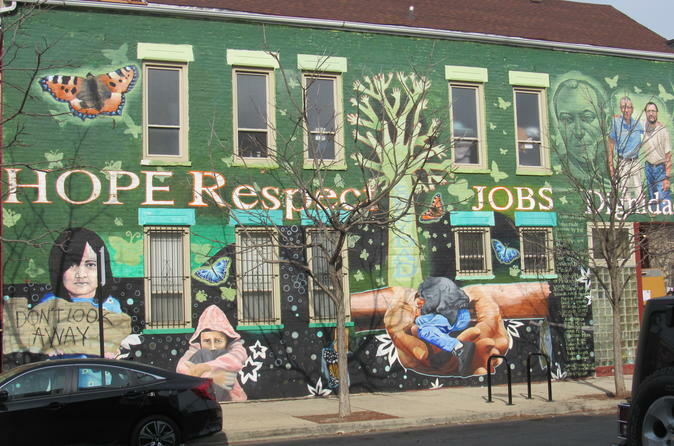 You'll follow your private expert guide through Chicago's most colorful, vibrant and diverse neighborhoods on this lively tour that showcases the best of Pilsen's public art pieces. As you tour the neighborhood, you will learn about the cultural and historical significance of the area and discover the creative spirit of local artists. Throughout your tour, your knowledgeable guide is at your service and available to answer questions about the area and provide recommendations for meals and activities after the tour. Your tour will conclude at the meeting location where your guide can provide directions if you need them.